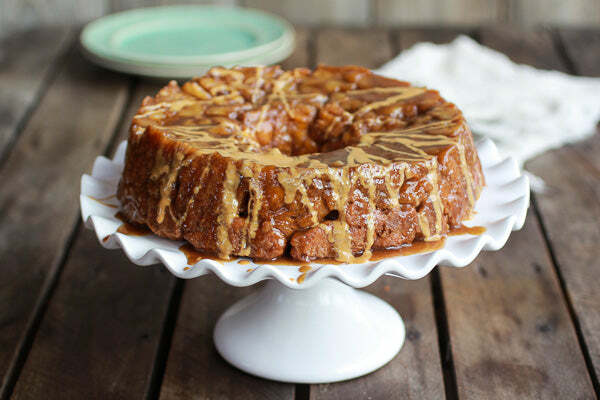 The inspiration for this recipe came from my love of pumpkin, monkey bread and holiday entertaining. Every year for Christmas breakfast my mom makes her famous monkey bread. Guys, it is so good and also pretty special since we only have it on Christmas morning. Yes, only once a year! 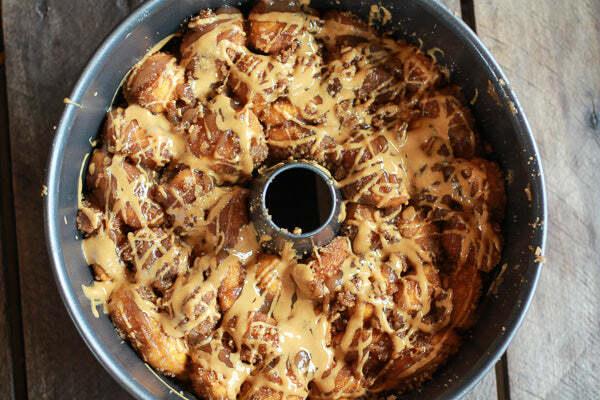 Enter this monkey bread. It is completely different, but in an amazing way! 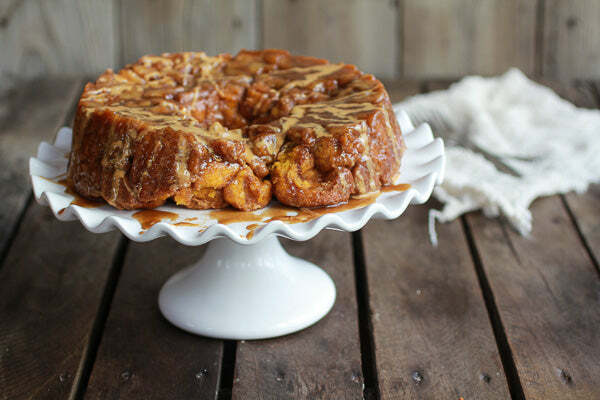 The monkey bread dough is pumpkin spice. Meaning it is stuffed with pumpkin and pumpkin pie spice. Then the dough balls are generously drizzled with creamy peanut butter. Oh my gosh, I know! So awesome! Oh, and there are some caramelized bananas hidden on top too, but if you have any banana haters they can easily be left out. 1. 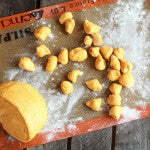 Place the butter and milk into a small bowl and microwave for 30 seconds until warmed through and butter starts to melt. You want the milk hot, but not steaming. Sprinkle the yeast over the warm milk. 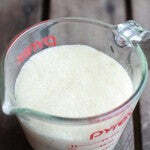 Now sprinkle the sugar over the yeast and stir to combine. Let sit until foamy and the mixture smells like bread. 2. Meanwhile, add the pumpkin, salt, sugar, and egg into the bowl of a stand mixer. 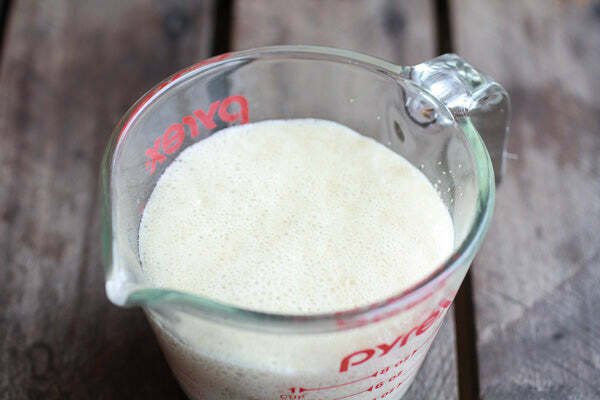 Mix ingredients well and then add the yeast mixture into the dry ingredients and mix with the bread hook attachment. Slowly add the flour and knead the dough for about three minutes with the mixer on medium speed. Use a rubber spatula to scrape down the edges as needed. 3. 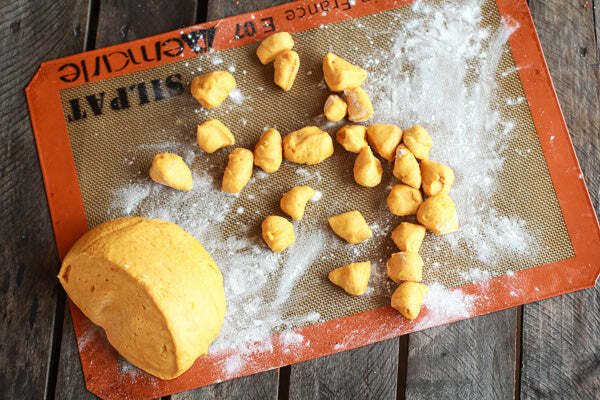 Once a dough ball has formed in the center of the bowl or the bread hook, continue to knead on the hook for 5 more minutes. Cover with plastic wrap and let rest in a warm place for about an hour and half. 4. 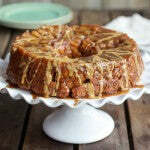 Grease a Bundt pan and sprinkle the bottom of the pan with two chopped bananas. 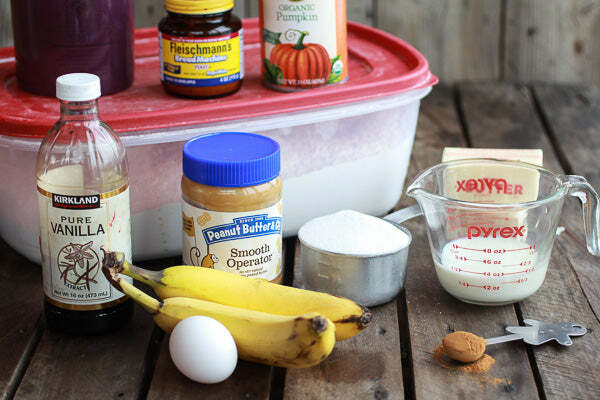 Sprinkle the bananas with 1 tablespoon brown sugar. 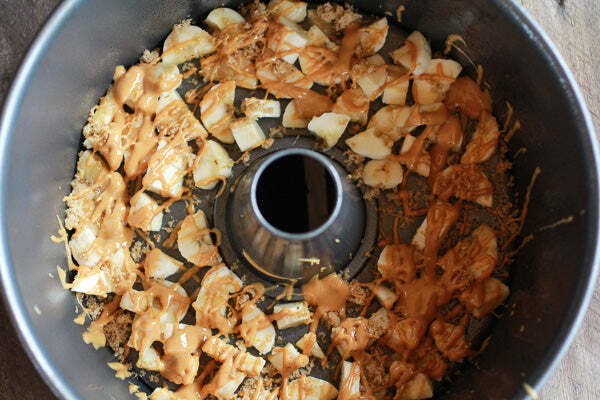 Add the peanut butter to a microwave safe bowl and microwave for 30 seconds. Drizzle a few tablespoons of the warmed peanut butter over the bananas. Set aside. 5. 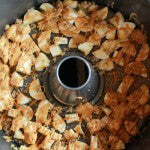 To a medium bowl add the 1½ cups brown sugar and 2 teaspoons cinnamon and mix well. To another bowl add the melted butter. 6. When the dough has doubled in size, remove from bowl. And begin to break off golf ball-sized pieces of dough. 7. 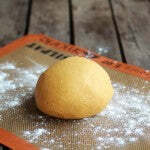 Set up an assembly line of dough balls, melted butter, cinnamon sugar coating and lastly your Bundt pan. Working with one ball at a time dip each ball in the butter and then drench the buttered ball in the cinnamon sugar coating. Place coated dough balls into the greased Bundt pan, right on top of the bananas until you have your first layer of dough balls. 8. Now if desired add the remaining chopped bananas on top of the first layer of dough ball. Drizzle the first layer with a few tablespoons of the warmed peanut butter. 9. 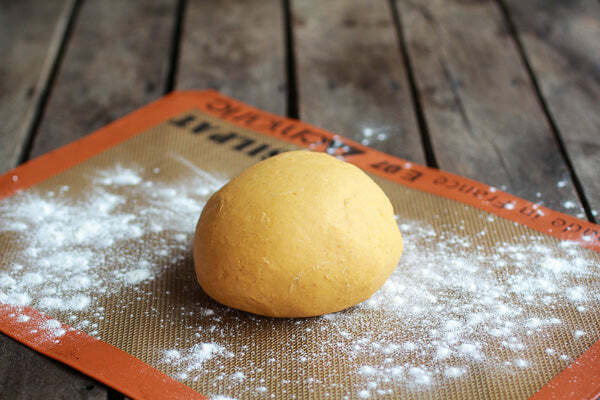 Continue adding the remaining dough balls to the pan until you have used all the dough. You should have about 2 layers of balls now. Drizzle the final layer with the remaining peanut butter. Cover and let rise in a warm place until doubled in size, about 1-2 hours. About 20 minutes before the bread is done rising preheat the oven to 350°F. 10. Bake the bread for 35 to 45 minutes. If the top of the bread is getting too brown cover the Bundt pan with foil. Remove and let cool for about 10 minutes in the pan. 11. 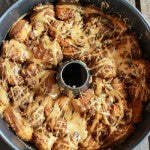 Invert the Monkey Bread onto a large plate and if desired drizzle with more peanut butter. EAT! *Bread dough adapted from here. 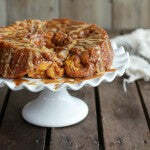 Tieghan adds banana layers to this monkey bread recipe. What other fruits or add-ins do you think would taste good with the peanut butter and pumpkin? – The giveaway is open to USA residents only and will run until Monday, December 2, 2013 at 11:59 PM EST. – Winner(s) will have until 12/2/13 to claim their prize or we will choose another winner. 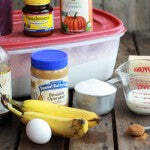 The post Peanut Butter Banana and Pumpkin Monkey Bread appeared first on - Peanut Butter & Co. Recipe Blog.